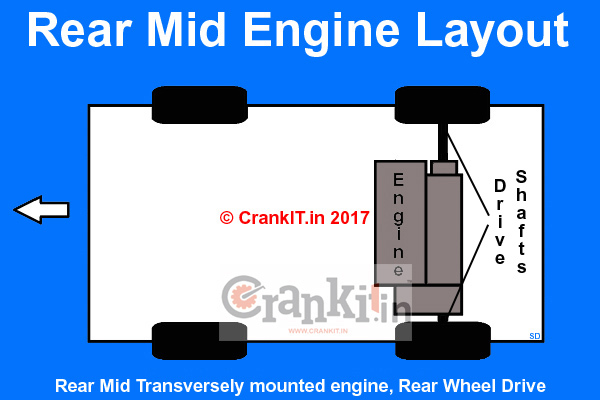 What is Mid Engine Layout? In the Mid Engine layout, an engine sits in the middle of a vehicle. In most of the vehicles, the engine sits at the front. This is because this offers effective cooling to run it efficiently. However, due to some design constraints, engineers use the Mid-engine layout. 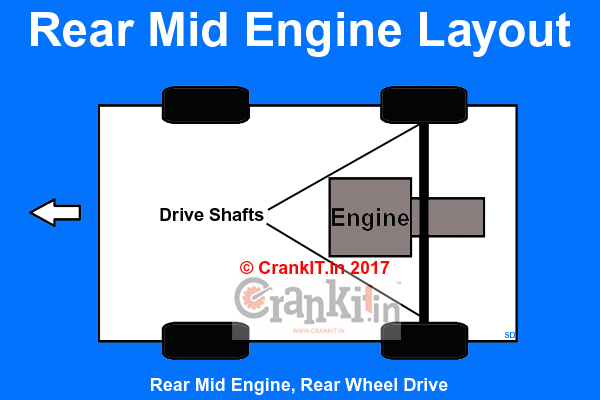 This layout places the engine in the middle of the vehicle. However, it is generally between the front and rear axles. In the vehicle with this layout, the rear tires carry more weight. So, they get more traction and provide more assistance to the front tires while braking. Thus, it reduces the chance of rear-wheel locking and skidding or spinning. The mid-engine design also provides added empty space at the front of the vehicle between the bumper and the windshield. This layout is beneficial to absorb more energy in case of a frontal collision. It acts as a cushion. And thus, it minimizes the intrusion into the passenger compartment. However, the main advantage of mid-engine layout is better weight distribution. Placing the heavy engine in the middle lowers the moment of inertia. The biggest disadvantage of this layout is the limited rear passenger space. As a result, most mid-engine vehicles are the two-seater. The longitudinally mounted front mid-engine layout puts the engine at the Mid-front location and behind the front axle line. It fits along the vehicle’s length which is parallel to its wheels. The engine attaches to the gearbox and drives the rear wheels thru’ a propeller shaft as seen in the diagram. Some of the popular vehicles with longitudinally mounted mid-front engine layout with rear-wheel drive are Honda S2000 and Mercedes-Benz SLR McLaren which use a similar layout. 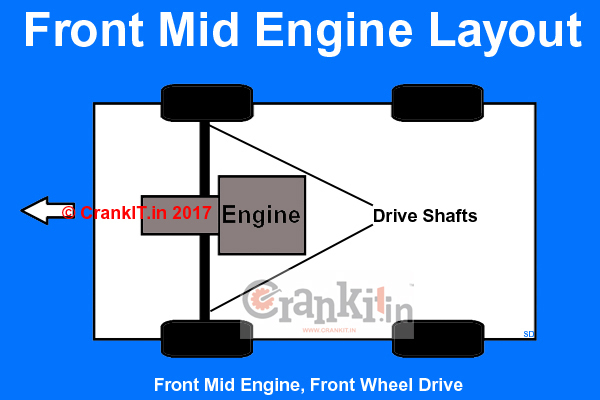 The longitudinally mounted front mid-engine layout places the engine at the Mid-front location and behind the front axle line. It fits along the vehicle’s length which is parallel to its wheels. The engine attaches to the gearbox and drives the front wheels thru’ drive shafts as seen in the diagram. Some of the popular cars with longitudinally mounted mid-front engine layout with front-wheel drive are Saab Sonett and Nissan GT-R LM Nismo. The longitudinally mounted rear mid-engine layout places the engine at the Mid-rear location and ahead of the rear axle line. It fits along the vehicle’s length which is parallel to its wheels. The engine attaches to the gearbox and drives the rear wheels thru’ drive shafts as seen in the diagram. Some of the popular cars with longitudinally mounted rear mid-engine layout with rear-wheel drive are Porsche 550, Porsche 914 and Porsche Boxter which use a similar layout. The transversely mounted rear-mid layout places the engine at the Mid-rear location and ahead of the rear axle line. However, it fits across the vehicle’s length which is 90 degrees to its wheels. The engine attaches to the gearbox and drives the rear wheels thru’ drive shafts as seen in the diagram. Some of the popular cars with transversely mounted rear mid layout with rear-wheel drive are Lamborghini Miura and Lancia Stratos HF which use a similar layout. 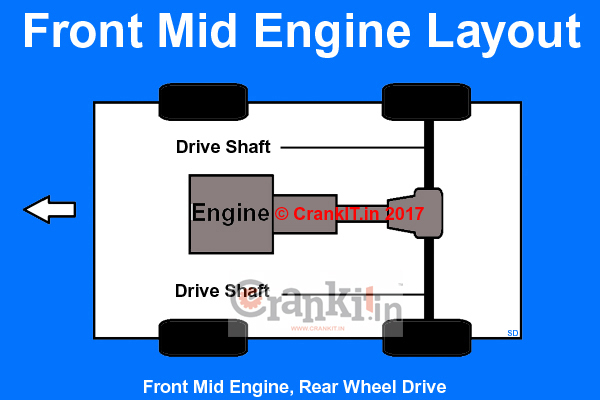 Home » Technical Anatomy » What Is Mid Engine Layout And What Are Its Benefits? What is ExhausTEC or Exhaust Torque Expansion Chamber? What is PFi/PGMFi – Fuel Injection Technology?